When: 25th & 26th April 2015, 1-4 & 5-8pm on both days. Where: Flow Studio Belfast, Cathedral Quarter, Belfast, BT1 2LB. Cost: Half day £30, one full day £50 & all weekend £80 (bookings are made direct with the studio). 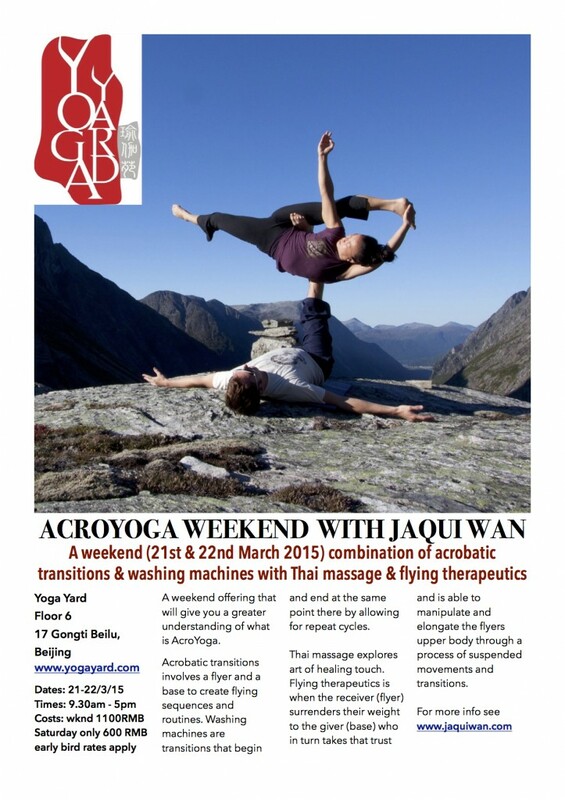 A weekend intro into the immense practice that is AcroYoga. Solar Saturday will introduce the art of inversions, partner acrobatics & transitions a day to tap into your fearless inner child. Whilst Lunar Sunday is an exploration into the healing touch of Thai massage and flying therapeutics. An opportunity to discover your human potential. Come be supported and enjoy a journey of connection, trust & play. Jaqui Wan is a supportive yet challenging teacher. Her practice is both powerful & dynamic but she also encourages playful collaboration and connection. 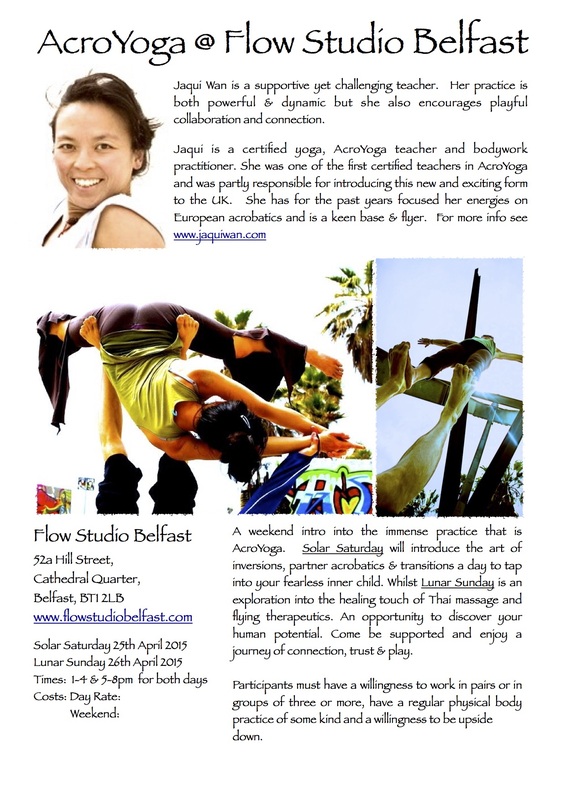 Jaqui is a certified yoga, AcroYoga teacher and bodywork practitioner. She was one of the first certified teachers in AcroYoga and was partly responsible for introducing this new and exciting form to the UK. She has for the past years focused her energies on European acrobatics and is a keen base & flyer. A day long offering to work on collaboration and bringing individual strengths together and with these building blocks explore what the infinite possibilities are. We will work progressively, getting you strong in your physical body and building on your mental well being allowing you to try things that may seem impossible and making them possible. Learn to build a three person static balances often referred to as trio pyramids. There could be two flyers and one base or vice versa. For this session you will be working in groups of at least five, with two spotters supporting each trick. You will learn how to build trio pyramids progressively and be supported in the process. A weekend introduction to AcroYoga. 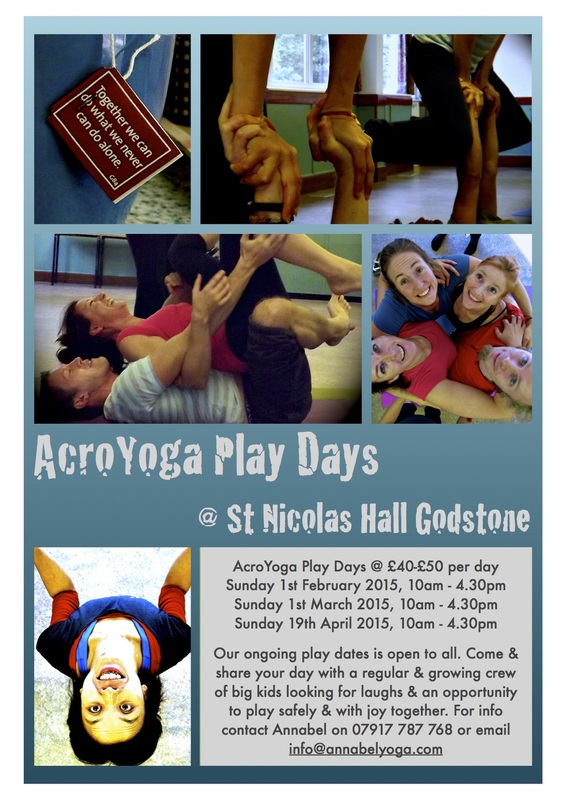 An opportunity to explore acrobatic transitions, washing machines, Thai massage and flying therapeutics. We will begin with a series of static poses, involving a flyer and a base and once the foundations are set the intention would be to piece them together to create flying sequences. Students will work in groups of three; base, flyer and spotter(s), I will encourage everyone to play with all the roles and collaborate progressively in building acrobatic flying sequences and routines. These sequences can often be complicated and challenging, requiring good physical strength, stamina and communication between the base and flyer. I will teach patterns that can be repeated as cycles which are more commonly called washing machines in Europe and North America. I will introduce this healing art form; covering its traditional links with Buddhism and metta bhavana (loving kindness), working the whole body from the feet upwards to the top of the head: or cover specific areas that can support the practice of Flying Therapeutics as mentioned below. This is also considered part of the healing arts within the practice of AcroYoga. I will cover a number of principles in the practice of therapeutic flying, where the receiver (flyer) surrenders their weight to the giver (base) who in turn takes that trust and is able to manipulate and elongate the flyers upper body through a process of suspended and supported movements and transitions. Bookings are made directly with the studio. A day long opportunity to focus on your solo practice, the intention is to explore and challenge our physical and mental boundaries. An asana sequence that is guaranteed to challenge the most experienced of yoga practitioners. The practice will combine acrobatic conditioning with inversions and numerous advanced poses to bring about a complete all round physically energising experience. Suited to students who are comfortable in exploring their physical bodies. After the asana session there will be time to work together on assisted stretched ofter known as partner yoga. 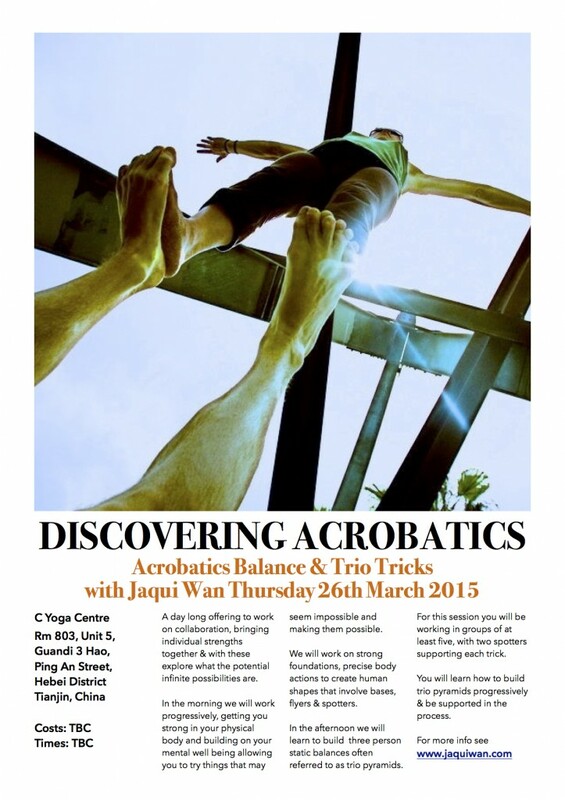 An opportunity to delve into the world of balancing on your hands. Have you ever been baffled by arm balances? Is it strength? Is it flexibility? Or is it fear that’s stopping you from getting your head round them? 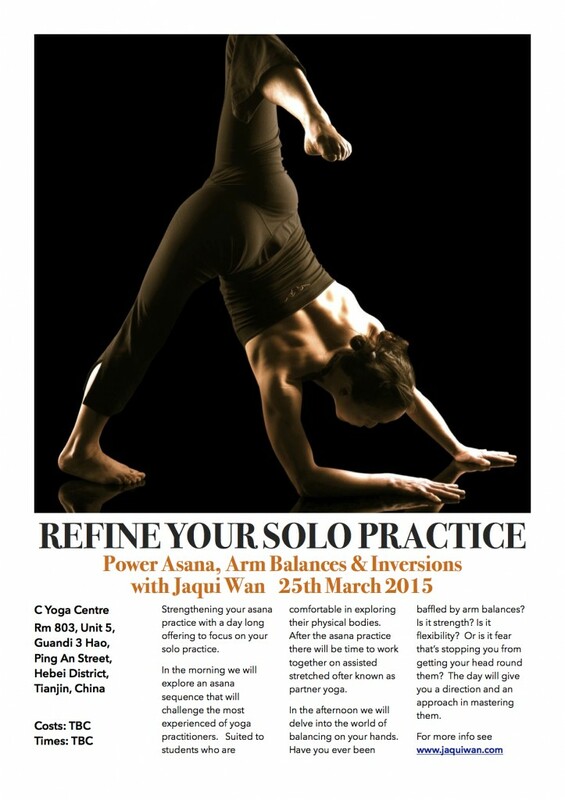 This session is an opportunity to explore the mechanics of balancing on your hands. The session will lead on from the mornings asana practice and will progress lab style into the world of hand and arm balancing. Do not be fooled into thinking you will be able to do all by the end of the session, that takes practice, practice, practice. What you will get is a direction and an approach in mastering them. Sunday 19th April 2015: 10am – 4.30pm Cancelled, due to double booking at the venue.